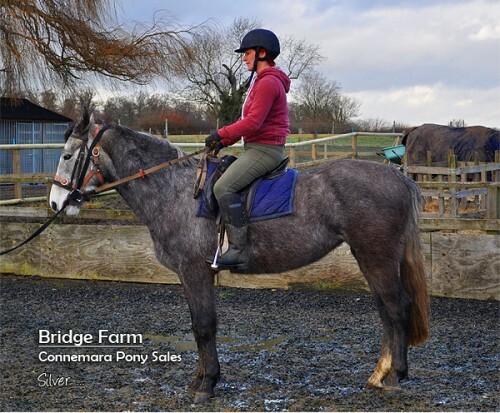 Silver is a very sweet Connemara mare who is in the middle of being broken. She is easy to tack up & lunge and has taken to being ridden very well. She stands to get on by the mounting block, ready and waiting to do her bit! We have got her as far as trotting round the manège by herself and steering is coming along nicely. This genuine Connemara mare LOVES JUMPING and has flown over jumps, whenever we have lunged her over them. She comes from performance bloodlines and we are sure she will go on to event or show jump. Silver was a little late developing and we have given her time to come on. 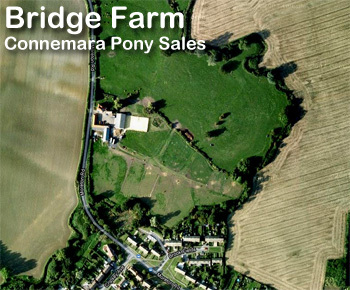 When she leaves Bridge Farm she will be established in walk, trot, canter and popping small jumps. She will also be hacking out.